The Malopolska province, whose capital city is Krakow, boasts six national parks – more than any other of Poland’s remaining fifteen administrative regions. All of the Malopolska national parks lie in a 150-kilometers radius around Krakow, most of them in the Carpathian Mountains south of the city. The nearest national park, Ojcowski Park Narodowy, stretches just 18 kilometers north from central Krakow while the most distant of the six, Magurski Park Narodowy, is a two-hour drive from Krakow. Two of the Polish national parks situated in the Malopolska province, Tatry National Park and Babia Gora National Park, constitute the UNESCO’s World Biosphere Reserves. Please note that distances are measured by road from the center of Krakow to the boundary of each national park. About 18 km north of Krakow by road. Area: 21.5 square kilometers, including 385 hectares of the strict nature reserve. Gateways: towns of Ojcow in the center of the Ojcowski national park and Skala near its northeast corner. Highest elevation: Gora Chelmowa 472 meters above sea level. Geography and geology: the park is part of the Jura Krakowsko-Czestochowska, a rolling upland made of Jurassic limestone. Main attractions: Pieskowa Skala castle, rock formations, caves, ruins of the Ojcow castle. The Ojcow National Park has been established in 1956 to protect scenic valleys of two small rivers, Pradnik and Saspowka. Named after the town of Ojcow that sits in its middle, the park can boast about 6,000 animal species (even if insects inflate the number substantially) and up to 1,000 plant species. Bird-watchers may expect sightings of 134 species of birds such as hawks, woodpeckers, owls, kingfishers, and herons. But the Ojcow National Park takes the greatest pride in its 15 species of bats whose colonies inhabit many of the park’s 400 or so known caves. There are efforts to reintroduce beavers into the park. The Ojcow National Park is very popular with the residents of Krakow mostly for its spectacular scenery marked by ravines and unusual rock formations, ancient monuments, and several caves accessible to the general public. 65 km south of Krakow by road. Area: 6,744 hectares including 2,420 hectares of three strict nature reserves. Gateways: villages of Poreba Wielka, Lubomierz, Lopuszna, and Ochotnica Gorna. Highest elevation: Kiczora 1,282 meters above sea level. Geography: The Gorce national park covers most of the Gorce range – though its highest peak Turbacz, 1,310 meters above sea level, is situated slightly beyond the park’s limits – of the Beskid Mountains, the northern edge of the Carpathian Mountains. Main attractions: vistas, primeval forests. The Gorce National Park has been established in 1981 to preserve relics of the Carpathian primeval forest. Woods take up 95 percent of its area and many beech trees and pines are 300 years old. Local fauna includes deer, lynx, zbik (Felis silvestris, wild cat), and ermine but the Gorczanski national park has chosen salamandra plamista (fire salamander, Salamandra salamandra), Poland’s biggest caudate amphibian, as its hallmark. 85 km southwest of Krakow by road. Area: 1,734 hectares including 1,061 hectares of strict nature reserve; 943 hectares of forests. Gateways: village of Zawoja, Krowiarki or Przelecz Lipnicka pass (road 957). Mountain hostel at Markowe Szczawiny. Highest elevation: Babia Gora – Diablak peak 1725 meters above sea level. Geography: the Babiogorski national park covers the summits and northern slopes of Babia Gora, the highest massif of Beskid Mountains which form the northern rim of the Carpathian Mountains, the park adjoins the border of Slovakia. Main attractions: vistas, forests, climbing. The Babia Gora National Park has been established in 1954 on the area protected since 1934. In 1977 the UNESCO listed it as a World Biosphere Reserve. The park can boast around 700 species of flowering plants plus 200 or so species of mosses, about 200 species of lichens, and roughly 100 species of algae. The flora of the Babia Gora National Park make up distinct belts related to climatic zones changing with altitude – mixed forests at the bottom, followed by spruce woods, next belt of dwarf mountain pines, then alpine grasses, and lastly bare rock with sparse vegetation. The park’s animal species include lynx, bear, wolf, deer, and grouse. The park is very popular with weekend trekkers thrilled to conquer the Babia Gora craggy peak and hiking trails are rather crowded in summer. Several rough mountain tracks lead to the top including famed Perc Akademikow that gives a taste of truly alpine mountaineering. 100 km south of Krakow by road. Area: 21,164 hectares including 11,514 hectares of strict nature reserves. Gateways: town of Zakopane, villages of Koscielisko, Bukowina Tatrzanska, and Kiry, car park at Palenica Bialczanska (road 960). 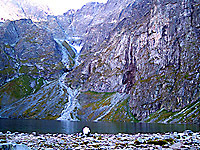 Mountain hostels: Morskie Oko, Polana Chocholowska, Hala Kondratowa, Dolina Pieciu Stawow Polskich, Dolina Roztoki, Hala Ornak, Murowaniec (Hala Gasienicowa). Highest elevation: Rysy summit 2499 meters above sea level. Geography: the Tatrzanski national park covers the Polish part of Tatry Mountains, group of rugged ranges 60 kilometers long and 16 kilometers wide, the highest part of the entire Carpathian Mountains; the park borders on Slovakia’s counterpart, Tatranski Narodny Park (TANAP). Main attractions: mountaineering and trekking, skiing, alpine scenery, cable car to the top of Kasprowy Wierch mountain (1987 meters above sea level). Tatra Mountains National Park has been established in 1954 on the area protected since 1937. In 1992 the UNESCO proclaimed it the Tatry International Biosphere Reserve together with the adjacent Tatranski national park of Slovakia. The flora of Tatry National Park consists in nearly 2,000 species of plants, including 91 endangered species, some endemic to the Tatra Mountains. The park’s vegetation form belts, typical for high mountains, that match changing climate conditions at different altitudes. Mixed forests reach to about 1200 meters above sea level, spruce woods up to 1550 meters or so, belt of dwarf mountain pines up to roughly 1800 meters, alpine grasses to about 2300 meters, and next bare rock with sparse vegetation. Distinctive plants of the Tatra National Park include limba (stone pine, Pinus cembra) and szarotka (edelweiss, Leontopodium alpinum), and many travel to the park in springtime to see its meadows covered with wild crocuses. The Tatry Mountains National Park boasts 53 species of mammals including one endemic rodent (polnik tatrzanski), 101 species of birds, three species of reptiles, seven species of amphibians, and six species of fish. The park’s emblematic animals are swistak (marmot, Marmota marmota) and kozica (chamois, Rupicapra rupicapra). Also, its fauna includes brown bear, lynx, deer, and wolf. Birdwatchers may hope for sightings of orzel przedni (golden eagle, Aquila chrysaetos). The Tatry National Park also preserves spectacular landscapes typical of high mountains with sharp peaks, sheer cliffs, moraines, glens, chimneys, gullies, screes, etc. Plus streams, waterfalls (highest Wielka Siklawa, nearly 70 meters), tarns and lakes (largest Morskie Oko – 34.9 hectares, deepest Wielki Staw Polski – 79.3 meters). Also caves. 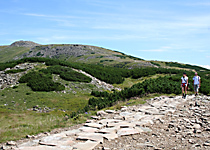 Hiking and trekking trails in the Tatry National Park total 250 kilometers. Most popular destinations are Morskie Oko lake, Giewont peak, and valleys Dolina Koscieliska and Dolina Chocholowska. 105 km SSE of Krakow by road. Area: 2,231 hectares including 777 hectares of strict nature reserves. Gateways: towns of Szczawnica and Kroscienko, villages of Niedzica, Czorsztyn, and Sromowce Wyzne. Highest elevation: Trzy Korony peak 982 meters above sea level. Geography: the Pieninski national park takes up most of Pieniny range in the Carpathian Mountains on the left, Polish bank of Dunajec river (the opposite riverbank belongs to Slovakia). Main attractions: scenic vistas, hiking and trekking, rafting. The Pieniny National Park has been established in 1954 in the area protected since 1932. It boasts surprising richness of flora and fauna. Some 13,000 animal species live within its borders, half of the total number of species that exist in Poland. Among them are 1,550-plus species of butterflies. The park’s most noteworthy mammals are lynx and zbik (Felis silvestris, wildcat). Also birds such as orzel przedni (golden eagle, Aquila chrysaetos), eagle owl, and thrush nagorniak skalny. The Pieniny National Park consists in mixed forests and vast meadows. Their rich flora includes 30 species of wild orchids. 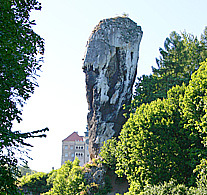 Landscape of the Pieninski national park is marked by sheer limestone crags piling up on gentle slopes. Most impressive are cliffs of Dunajec Gorge where the river meanders in seven curves for eight kilometers between rock walls that rise up as high as 300 meters to 500 meters. In summer rafting through the Dunajec Gorge attracts vast crowds. To the west the Pieniny Mountains National Park borders on the Jezioro Czorsztynskie artificial lake, a major recreational area in the region. There are two medieval castles on its banks, Niedzica and Czorsztyn, both situated within the limits of the Pieniny park. Ruins of another castle sit near the top of Zamkowa Gora (Castle Mount) in the eastern part of the park. 130 km southeast of Krakow by road. Area: 19,439 hectares including 2,408 hectares of strict nature reserves. Gateways: villages of Krempna, Swiatkowa Wielka, Wapienne, Brzezowa, Mrukowa, Grab, Olchowiec, Bartne, and Folusz. Highest elevation Watkowa 845.9 meters above sea level. Geography: the Magurski national park is located on both banks of the Wisloka river in the Magura Ranges (Pasma Magurskie) of the Beskid Niski Mountains, part of the Carpathian Mountains. The park adjoins Poland’s border with Slovakia and most of its area, roughly ninety percent, lies in the Podkarpackie province while the northwest corner belongs to Malopolska. Main attractions: hiking, wooden architecture. The Magura National Park has been established by the end of 1994. Mixed forests cover 1,8572 hectares of it, meadows and brush amount to 830 hectares, and about 38 hectares are taken up by watercourses. The flora of the Magura National Park consists of 767 species of vascular plants including 59 strictly protected species, 11 partially protected species, and twelve species registered in the “Red List of Endangered Plant Species in Poland”. The park boasts 57 species of mammals such as lynx, wildcat zbik (Felis sylvestris), wolf, elk (Alces alces), beaver (Castor fiber), river otter (Lutra lutra), badger (Meles meles), red deer (Cervus elaphus), roe deer (Capreolus capreolus), fox (Vulpes vulpes), pine marten (Martes martes), beech marten (Martes foina), European polecat (Mustela putorius), ermine (Martes erminea), and weasel (Martes nivalis). There are 117 species of birds breeding in the Magurski national park including buzzard (Buteo buteo), lesser spotted eagle (Aquila pomarina), sparrowhawk (Accipiter nisus), golden eagle (Aquila chrysaelos), eagle owl (Bubo bubo), tawny owl (Strix aluco), long-eared owl (Asio otus), pygmy owl (Glaucidium passeinum), great spotted woodpecker (Dendrocopos major), black woodpecker (Dryocopus martius), white-backed woodpecker (Dendrocopos leucotos), three-toed woodpecker (Picoides tridactylus), kingfisher (Alcedo atthis), little ringed plover (Charadrius dubius), sandpiper (Actitis hypoleucos), dipper (Cinclus cinclus), grey wagtail (Motacilla cinerea), raven (Corvus corax), black stork (Ciconia nigra), corncrake (Crex crex), quail (Coturnix coturnix), and red-backed shrike (Lanius cullorio), plus over 20 migrant birds. Also, the park is inhabited by 10 species of amphibians, 6 species of reptiles, and 12 species of fish. There are 85 kilometers of hiking trails in Magura National Park that mostly run through rolling hills. Apart from landscape and nature points of interest consist mostly in the village’s wooden architecture of the Orthodox churches. With its mere 21.5 sq. km it may be the smallest of Poland’s twenty national parks, but the Ojcow National Park ranks among the most attractive recreational areas in Europe, and it is just a 15 minutes’ drive–i.e. 24 km–northwest of Krakow. Downtown green oasis boasts some 5,000 plant species. A vast expanse of grassland in downtown Krakow, called Blonia, is protected by law as the national heritage. The best way to enjoy Krakow is on foot. Copyright © 2009-2018 by MAREK STRZALA. All rights reserved.